Alaska Governor Frank H. Murkowski welcomed the Interior Department announcement on Wednesday to open almost 400,000 acres on Alaska's North Slope for exploratory oil drilling some of the most promising oil and gas areas in the northeast corner of the National Petroleum Reserve-Alaska. The amendment to the Northeast National Petroleum Reserve-Alaska 1998 plan was approved Wednesday by Deputy Assistant Secretary of the Interior, Chad Calvert, paving the way for drilling in an area that previously had been off limits because of concerns about the impact on wildlife. The approval came just three weeks after Congress blocked energy development in the nearby Arctic National Wildlife Refuge. "I am very pleased with today's Interior Department decision," said Governor Murkowski. "It is consistent with my administration's recommendations, and reinforces the fact that Alaska's abundant energy resources are absolutely critical to meeting our nation's energy needs." The Northeast National Petroleum Reserve-Alaska may contain as much as two billion barrels of economically recoverable oil according to the Bureau of Land Management officials. This decision also opens the way for an additional oil and gas lease sale, probably in the fall of 2006. The Interior Department gave final approval to develop the Teshekpuk Lake region, setting up an oil-lease sale in September. The decision came a year after the Bureau of Land Management recommended drilling in the region, which lies west of the wildlife refuge on Alaska's North Slope. "Alaskans have proven that we can develop our tremendous oil and gas reserves in environmentally responsible ways while at the same time protecting subsistence resources," Governor Murkowski said. "Today's announcement from the Interior Department is very good news for our state." However, opponents say the decision eliminates long-established wildlife and environmental protections first put in place by Reagan Administration Interior Secretary James Watt. Eleanor Huffines, Alaska Regional Director of The Wilderness Society said, "The Administration today opened 100 percent of the northeast NPRA to drilling. Apparently 87 percent wasn't enough for the oil companies. Even more outrageous is the administration's attempt to dress this up that as 'environmentally responsible' decision." She stated, "This decision ignores the voices of leading scientists, sportsmen from across the nation, and the Alaska Native people who depend on the wildlife and subsistence resources of the region." Stan Senner, executive director of Audubon Alaska said, "This plan is utterly unbalanced: even the Reagan Administration protected the waterfowl habitat around Teshekpuk Lake because of its world-class ecological and cultural value." He said, "No one should be fooled by the window dressing in this document: this plan makes every last acre available for oil development. The administration has decided that there isn't one acre of this magnificent region that should be protected." Bureau of Land Management officials say the amendment will guide leasing, exploration and development in the Petroleum Reserve for the next 10 to 20 years using lease stipulations and required operating procedures similar to those adopted for the adjacent northwest area of the Petroleum Reserve in 2004. The Record of Decision, signed January 11, 2006 contains a number of changes to the Final Amended Integrated Activity Plan and Environmental Impact Statement released in January 2005. "As a result of comments from local government, North Slope residents, and various organizations, a number of modifications have been included specifically to benefit subsistence users and wildlife values in the northeast planning area," said Bureau of Land Management Alaska State Director Henri Bisson. "Also, the plan will allow us to refine and adapt our management as new research and new technologies emerge," said Bisson. -An expansion of the "No Surface Occupancy" restriction protecting sensitive goose molting habitat area north of Teshekpuk Lake from 217,000 to 242,000 acres. 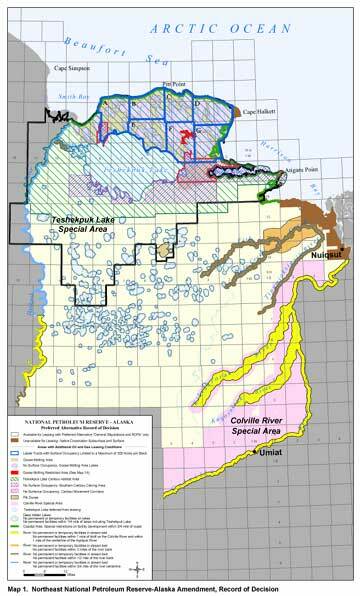 -The establishment of an additional "No Surface Occupancy" restriction protecting 47,000 acres of important caribou habitat and calving area located southwest of Teshekpuk Lake. The ROD reflects a total of approximately 188,000 acres of protection for caribou calving habitat southeast (141,000) and southwest (47,000) of the Lake. -Implementation requirements for a formal workshop(s) with federal, state and local, North Slope Borough representatives, and North Slope Science Initiative members and others, to recommend ways to minimize the impact of pipelines on subsistence users and wildlife resources. -Deletes language that would consider applications for the construction of publicly funded community roads within the Teshekpuk Lake Caribou Habitat Area. -Requires a minimum three-year study focused on protecting molting geese that utilize the lakes north of Teshekpuk Lake. The study must be completed before BLM will authorize construction of any proposed permanent facilities within the Goose Molting Area. -Defers leasing of the Colville River Special Area until a river management plan is completed. "Subsistence activities in the planning area, particularly hunting and fishing are exceedingly important to local residents. We have listened to their concerns and added these additional provisions to the plan to assure that local traditions can continue," said Bisson. Other provisions of the plan, such as deferring leasing on Teshekpuk Lake remain unchanged. According to information provided by the Wilderness Society, efforts to open the Teshekpuk Lake area to drilling have consistently drawn fire from a variety of groups, including the California Waterfowl Association, Ducks Unlimited, the Pacific Flyway Council, Wildlife Management Institute, The Wildlife Society, U.S. Fish & Wildlife Service, Environmental Protection Agency, The Nature Conservancy and numerous conservation groups. In addition, according to the Wilderness Society, 200 ornithologists and other wildlife professionals, and a bipartisan group of the Congressional Sportsmen's Caucus called for Teshekpuk Lake area protections to remain in place.